The United States of America is a country built by immigrants. Every American citizen can trace their family tree back to their relatives that immigrated to the country. Still today, the US is one of the most popular countries for foreign nationals to move to. The US receives an estimated 1,000,000 legal immigrants per year, which includes people already living in the country who have their green card status updated. A former United States Air Force member, Ives found out first hand what it was like to bring a foreign national to the US following marriage. It was an eye-opening time for Ives, as he worked tediously on paperwork to bring his wife Jocelyn to the US. In 2009, Ives opened RapidVisa to help alleviate the stress customers are consumed with when applying for a US visa. With nearly a decade of helping people and over 35,000 approved visas under his belt, Ives’ company has become one of the premier businesses in immigration services. 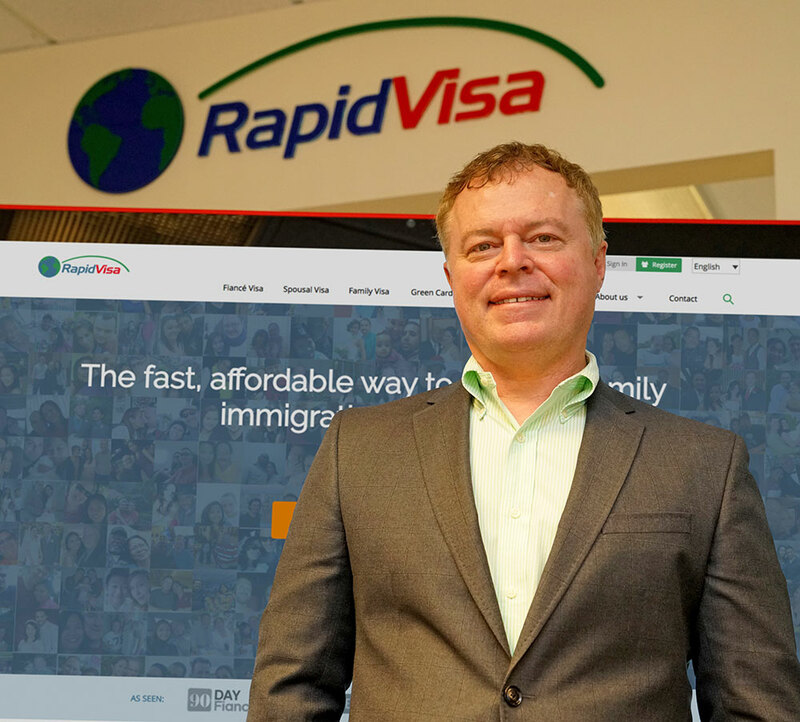 Ives spoke with Totalprestige Magazine about RapidVisa and the difficult process immigrants and family members must go through to live in the US. Ben, you launched RapidVisa in 2009 after an intensive period of developing the company. You found out first hand just how difficult the visa process is when marrying a foreign national. Can you tell me about why it was so difficult to legally bring your wife to the United States? For a country founded on immigration, most of us are pretty ignorant about the process, including me at that time. Most people can’t explain the difference between a visa, a green card and a passport. I thought a quick web search would get me going, but I learned that nobody back then was doing what we are doing now to automate the process of bringing a family member to the USA. While the process is tedious, the real problem is finding all the information you need to complete the long process. Years before founding RapidVisa, you spent time in the US Air Force. How did your military service influence you as a businessman later on? My four years in the US Air Force was transformative. The primary lessons I learned that have helped me in business is just how important it is to be organized, punctual and reliable. Additionally, the three years I spent in Germany really opened my eyes to the bigger world and the importance of cultural differences. Focusing on RapidVisa, how can the company ease the typical burden of gaining a visa to live in the US, and how difficult is it to gain admittance to the country? Immigrating by way of a family visa is really not difficult at all, if you know the process and give the government everything it wants. RapidVisa facilitates the process by holding your hand through the entire six to nine month process. We make sure the government gets what it wants when it wants it, and that you don’t miss important submission dates and appointments. It is a very stressful process for most people just because of the obvious importance tied to getting your loved one to the United States. We are here seven days a week to keep our customers moving through the process, and give them the peace of mind that everything is going as planned. Under the Trump administration, there have been new restrictions on people entering the US to live. How often do people seeking a visa get denied? The current travel ban is having a negligible impact on our business. The seven countries listed in the ban account for a tiny part of our business. Of course if your family member is one of the applicants banned from entering the US., the personal impact is enormous. The bigger impact the Trump administration is having to our business is byway of “extreme vetting”. While this increased scrutiny doesn’t seem to be impacting approval rates, it is dramatically slowing down the process. We estimate that approval times have increased by two to four months since the new administration arrived. Is it going to getting more strict or difficult for people to gain entry into the US to live? Obviously, if you are from one of the seven banned countries it is nearly impossible to immigrate right now. But for everyone else we are only seeing increased wait times, with no discernable increase in denial rates. However, our experience is probably not representative of the whole industry since we turn away applicants who have complicated legal situations that require the advice of an attorney. What are reasons people get denied a visa today? The number one reason we see for denial is finances. The government requires that you demonstrate adequate income to support the intending immigrant. For most people, this means showing income of at least 125% of the poverty level for your household size plus the immigrant. Many people need the help of a joint sponsor, similar to a cosigner, to meet the requirements, but it can be very difficult to convince somebody else to commit to financially supporting your migrating family member or fiancee. However, even with these cases the approval rate is actually quite high considering all the rhetoric around curbing immigration. The current approval rate with RapidVisa is about 97%. The RapidVisa website and social media is full of testimonials from those you have helped. What does it mean to you to help these people, especially after you went through a similar situation? I love to tell people that we have helped over 35,000 people immigrate legally to the United States. That’s an amazing number that I’m quite proud of and it grows everyday. I have been fascinated with migration from an early age and very much enjoy being a small part of modern day migration. Humanity is so much more than any one country. When individuals prepare their own immigration applications and papers, what are the biggest mistakes that they make? Most mistakes are caused by not knowing what forms to file. While it’s easy to figure out what primary form you need, there are always supplemental documents which can vary depending on your situation. But even when customers figure out all the forms and documents they need, they struggle to know exactly when and where to file the forms. It is not a “file and forget” process. You have to file several sets of documents, all to different offices at different times throughout the process. What’s the major differences between RapidVisa and hiring an immigration attorney? Three things – Value, Service and Specialization. It costs a lot of money to run a law office. An attorney simply can’t afford to sell at our rates. And when is the last time you found a law office that was open seven days a week to take questions by phone, email and chat? But perhaps our biggest advantage over an attorney is our volume. We process more visas in a month than one attorney may do in her entire career. Because most attorneys are focused on serving only their local community, they must take a variety of case types to keep their billable hours up. Because our services are sold throughout the world, we can focus intently on just a few visa types. This specialization gives us unparalleled information about the rapidly changing requirement from US embassies throughout the world. Of course, we are not a law firm, so if a person has a legal problem with their immigration request we would refer them to a qualified immigration attorney. This is one reason we don’t provide services to undocumented immigrants. Ben, of course you run a company and a very successful one, but do you also see yourself as someone doing – for a lack of a better word – humanitarian work to help people? It would be disingenuous to put ourselves in the same league as the many great humanitarian organizations working in the immigration space. We are proudly a for-profit company. However, we do try really hard to keep our prices as low as possible. The legal industry in this country has positioned itself as a luxury product. Just look at the iconography around their marketing. The good news is that while the legal industry has failed to bring value to the average consumer, RapidVisa and other companies are bringing innovation to areas like divorce, bankruptcy, probate and immigration that are dramatically driving down costs. RapidVisa is proud to play its part in this disruption. For more information on Ben Ives and RapidVisa, please visit https://rapidvisa.com/.